Bento Rodrigues after the dam burst. Source: Paulo Figueiras/EM/D.A.Press . 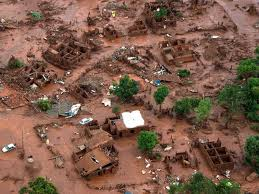 Already classified as the worst environmental disaster in Brazil, a mining dam of iron ore rejects burst on November 5th, 2015 at Mariana, Minas Gerais state. The responsible for the mining activities is Samarco, a joint venture of Vale from Brazil and Anglo-Australian company BHP Billiton. People lost their homes, their family, their life and we lost biodiversity. 30 days later, nothing much was done by Samarco to remediate the tragedy. Bento Rodrigues after the disaster. Source: G1 notícias. 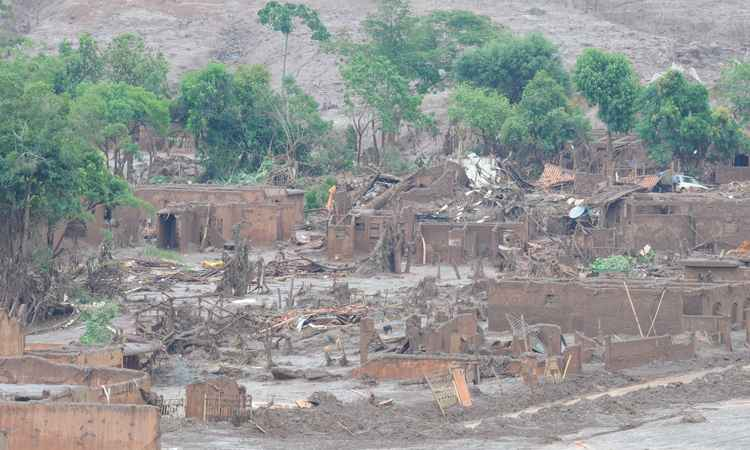 The village called Bento Rodrigues with 600 people was dragged and covered by the mud "tsunami" of 55 millions of cubic meters of rejects (55 billions of liters or 14.5 billions of gallons) released after the iron ore mine dam collapse. Most of the buildings are lost, more than 500 people lost their homes, several lives were taken. 13 people died, including two kids, and 8 are still missing. A painful tragedy that no words can describe. 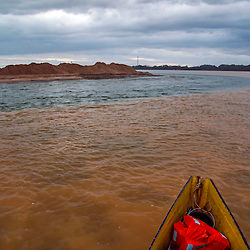 After destroying the village, the flood of mud traveled 55 Km of Gualaxo do Norte river, reaching Do Carmo river where it went down other 22 Km to Doce river. Hundreds of kilometers of the Doce river became covered by mud until it reached the Atlantic ocean 16 days after the dam burst. The disaster affected the whole hydrographic basin of Doce river and many cities have problems on water catchment and its quality. After striking people leaving in this area, the dam burst also threats the local biodiversity. The Brazilian Institute for the Environment and Renewable Natural Resources, Ibama, calculated that 15 square kilometers of land, including protected areas, were striked by the mud that traveled more than 500 Km (310 miles) to the ocean. Along the path taken by the mud, at least 1,249 fishermen were affected from more than 40 towns of Minas Gerais state and Espírito Santo state because of the water change killing many fishes. Already 9 tons of dead fishes were found on Doce river shore. At Espírito Santo coast, the mud reached the Atlantic ocean on November 21st, 2015. Samarco, the mine owner has tried to protect plants and animals by building barriers along the banks of the river but the efforts were uneffective. Ibama estimates that more than 80 native species of fish were affected by the disaster, of which 11 are classified as endangered and 12 are endemic to the Doce river. Ibama is focused on the rescue of endemic fish species of Doce river, but most of the fishes are already dead. Not only the fishes, but many other organisms can be seriously damaged because of the disruption of ecological processes that were lost. The mud suffocates aquatic species, and assoriates rivers and shores. More importantly, there is no consensus on the composition of the rejects and its toxic nature. With no further information, the losses are still immeasurable. Although Samarco insisted that the rejects on the mud is harmless, UN specialists and Brazilian scientists found toxic substances such as mercury, arsenic, chromium and manganese at levels much higher than the limit accepted for human health. The contradictory information of the mud toxicity slows down emergency actions and measures in favor of the people affected and prevent robust predictions of damage to environment.